What's better than receiving a heartfelt holiday card? Receiving a heartfelt holiday card that includes a lovely Christmas keepsake! 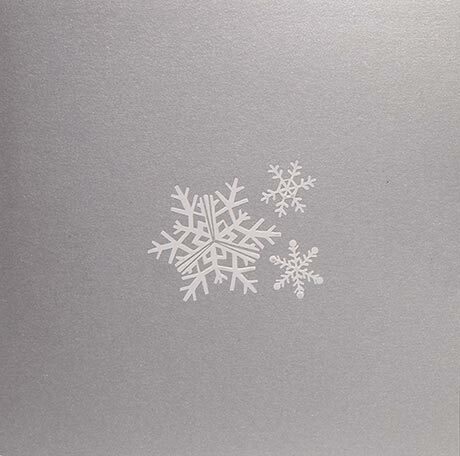 These 6"-square cards (sold individually) are pretty enough in their own right - silvery cardstock decorated with delicate snowflakes or shining gold ornaments. Yet when opened, each card reveals a cheerful greeting - "Got you a snowman that won't melt" is printed inside the Snowman Card, and "Happy Holidays!" is in the Ornament Card - along with an attached three-dimensional paper "gift": a snowman doffing his top hat or a colorful ball laser-cut with Christmas images. You can display the open cards on a tabletop; better yet, detach the ornament or snowman from its paper base and hang it on your Christmas tree! We think these cards - from PaperPopCards - make lovely thank-you notes for holiday party hosts, as well as delightful surprises for faraway friends or relatives. Each card includes a matching square envelope (extra postage required). Set of 2 cards.